The Intergovernmental Panel on Climate Change’s Fifth Assessment Report on the impacts of climate change was released recently. Here is a summary of what the report says about Latin America. Wreckage in Acapulco caused by the twin hurricanes that struck Mexico in September 2013. Severe weather events such as these are highlighted by the IPCC as one of many future hazards associated with climate change in Latin America. Photo courtesy of Bloomberg. Reduced agricultural productivity, water shortages, and the risk of poverty and socioeconomic inequality aggravating communities’ vulnerability to climate change: these are the key risks flagged up by the UN’s latest report on the impacts of climate change that are likely to happen if the world does not act to sufficiently reduce the amount of carbon released into the atmosphere. The report from the Intergovernmental Panel on Climate Change (IPCC), the second of three to be released on the causes, impacts and potential solutions to anthropogenic climate change, was released on Monday March 31st to much fanfare among scientists, environmentalists and governments around the world. While for many already in the know about the likely drivers and consequences of climate change, the latest report will not have revealed anything drastically new, I felt it would be a good opportunity to go over the main issues highlighted by the panel in its regional section on Central and South America – effectively covering the entirety of the Latin America and the Caribbean (LAC) region. This section of the report, compiled by some 30 authors and co-authors mainly from Latin America, but with the help of some distinguished climate scientists from Europe and the US, states that “significant trends in precipitation and temperature have been observed in Central America (CA) and South America (SA)”, something that has long been touted as one of the most potent signs of climate change acting out in Latin America, both now and in the future. These “changes in climate variability and in extreme events” have “severely affected” most parts of Latin America and the Caribbean, with the report highlighting increased annual rainfall in south-eastern South America (east of the Andes from a latitude roughly equivalent to that of Rio de Janeiro, down to one roughly equivalent to that of Buenos Aires), but decreased rainfall in Central America and central-southern Chile. There has also been observed warming of up to 1°C across most of the region, with the exception of some cooling off the coast of southern Peru and northern Chile, while the frequency of temperature and rainfall extremes across the continent has been said to have increased. Recent examples of these include the ongoing severe drought in Casanare, Colombia; heat waves around Buenos Aires over the past southern winter; and flash-flooding and landslides around Rio de Janeiro in recent years. Other severe weather events, namely storms and hurricanes in Central America and the Caribbean, are also set to rise in frequency even more than they already have – the report notes that during the 2000-2009 decade, there were 39 hurricanes in the Central America-Caribbean basin, compared to 15 during the 1980s and just 9 during the 1990s. These regions are also set to suffer from further sea-level rises, which are reported to have varied from 2 to 7 mm/year between 1950 and 2008, adding to the risk of significant damage from storm surges associated with these tropical cyclones. Furthermore, IPCC projections suggest that the region can expect further warming this century of anything between 1.6°C and 6.7°C, compared to the 1986-2005 average. This, the panel warns, will aggravate problems already being felt across Latin America’s highland regions due to the melting of glaciers, which along with further shifts in rainfall patterns will contribute to “changes in stream flow and water availability” which are already being detected and are projected to continue in the future, “affecting already vulnerable regions”. The report indicates that the “risk of water supply shortages will increase owing to precipitation reductions and evapotranspiration increases in semi-arid regions … thus affecting water supply for cities … hydropower generation … and agriculture”. 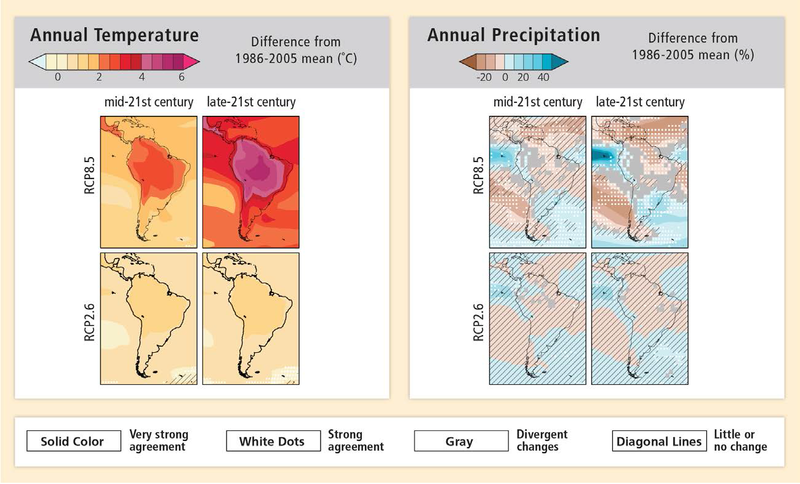 Projected temperature and precipitation changes across Latin America. Image taken from the IPCC Fifth Assessment Report, Working Group II, regional report on Latin America and the Caribbean. Land use changes, which in some cases have been brought about by increased rainfall in some areas and which include the expansion of agricultural activities, are also said to “[contribute] significantly to environmental degradation exacerbating the negative impacts of climate change”, affecting already-fragile ecosystems such as the fringes of the Amazon rainforest and the tropical Andes, and leading to biodiversity and ecosystem loss. The report also notes that this phenomenon is in itself “a driver of anthropogenic climate change”, meaning that given the impact of climate change on ecosystems and biodiversity, tropical regions such as those in Latin America risk being caught in a vicious cycle where land use change and climate change aggravate each other in turn. Deforestation remains a problem across parts of Latin America, despite progress in curbing rates in the Amazon. Changes in agricultural productivity across Latin America are expected, with implications for food security as well as economic development, given the agricultural export component of many countries’ economies. While south-eastern South America could see medium-term increases in agricultural productivity due to projected rises in annual rainfall, other regions such as Central America, north-eastern Brazil and parts of the Andes are more likely to suffer decreased productivity as a consequence of the higher temperatures and lower rainfalls that are projected for these areas. Reduced rainfall in these areas, as well as central and southern Chile, would also affect hydroelectric generation, which is Latin America’s most important renewable energy source. Some studies have suggested that hydroelectric projects could see their capacity reduced by over a third – and up to a half in places – by the end of the century, particularly in sub-Andean regions where glacial retreat will restrict future water supplies. 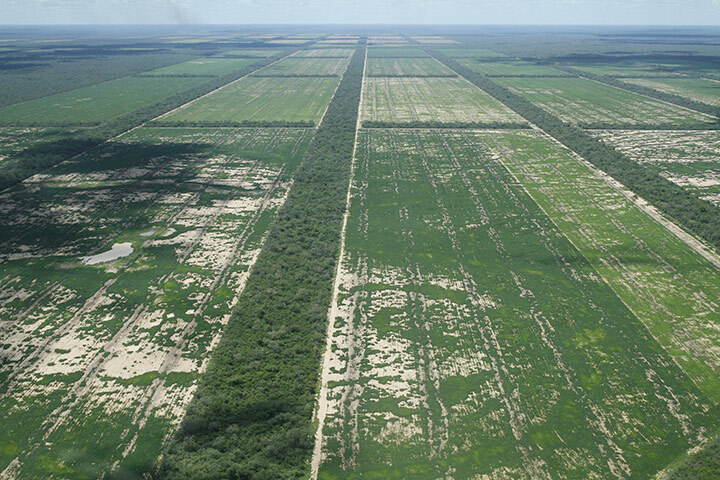 Cleared forest to make way for soya plantations in the Paraguayan Chaco. Land use changes such as deforestation and the expansion of agriculture are among the causes of climate change, and are a notable issue in Latin America. Photo courtesy of The Guardian. With regard to some of the social impacts, the report’s authors noted that socioeconomic conditions had improved across most of Latin America since the previous report in 2007, but that “there is still a high and persistent level of poverty in most countries resulting in high vulnerability and increasing risk to climate variability and change”. Furthermore, “economic inequality translates into inequality in access to water, sanitation and adequate housing, particularly for the most vulnerable groups translating into low adaptive capacities to climate change”. Poorer and more marginalised sectors of Latin American society often involve the rural poor and indigenous communities, but the report claims that these communities’ knowledge systems “have the potential to bring solutions even in the face of rapidly changing climatic conditions; although migration, climate change, and market integration are reducing indigenous capacity for dealing with weather and climate risk”. Among other climate change-related risks to societies, according to the report, are wider impacts on human health due to the emergence of diseases in previously non-endemic areas, threats to fishing activities and tourism in coastal areas (in particular around Central America and the Caribbean), and problems related to overpopulation and urbanisation such as pollution and access to clean water. The spread of diseases such as malaria, dengue and yellow fever would be mainly driven by higher temperatures allowing them to survive and thrive in regions previously too cool for them. This applies as much to human diseases as to agricultural ones and fungi, for example the coffee rust that has devastated coffee crops across Central America over the past couple of years as the mountainous areas favoured by coffee growers have become warm enough to host the fungus even at altitudes of up to 5,000 feet. The report also suggests that existing vulnerabilities in health, water, sanitation and waste collection systems, already under stress from regional population growth rates, could be further exposed and aggravated by the impacts of climate change. A tropical glacier in the Peruvian Andes. Latin America’s tropical glaciers are at increased risk of retreat due to rising temperatures, putting water resources and the livelihoods of Andean communities at risk. Photo courtesy of Reuters. Political imperatives on improving the socioeconomic conditions of the region’s poorest sectors can also contribute to governments concentrating more on these aspects, and thus directing more government funds to them, than on the longer-term challenge that is climate change. That is the opinion of the report’s authors, who also suggest that there is still a lack of full awareness of environmental changes and their implications for livelihoods and businesses, all of which means that the importance of planning for adaptation to climate change is bumped further down the political agenda of many countries, who may also lack the necessary funds and institutional organisation to carry out such plans in the first place. However, the authors point out that overcoming these difficulties as soon as possible is essential, given the growing role that many Latin American countries are playing in the world economy, and the importance that the region may hold in leading global efforts to counter the impacts of climate change. This importance stems from the fact that Latin America possesses the largest tropical forest on the planet, in the Amazon rainforest, and that it has “the largest potential for agricultural expansion and development during the next decades”. Additionally, “the region is already one of the top producers and user[s] of bioenergy, and this experience will serve as an example to other developing regions as well as developed regions”. There is also the risk, however, that the continuation of current trends of economic development and population growth could lead to further industrialisation and intensified land use, bringing with it an increase in carbon emissions. “Thus”, the report notes, “science-based decision-making is thought to be an important tool to control innovation and development of the countries in the region”. The range and scope of the evidence pointing to present and future impacts of climate change on Latin America and the Caribbean means that the above summary, while appearing relatively long, is actually about as brief as can be without missing out vital aspects! Should any readers want to read the full report for the region, it can be found here in all its glorious detail, while the web page for the entire report can be found here. It should also be noted that the reports released this week by the IPCC focus mainly on the impacts of climate change; more details on the science behind climate change can be found in the work of Working Group I, released in September, while the third and final instalment focussing on the possible solutions to climate change, which in the case of Latin America may well yield interesting discussions of topics such as renewable energy and Payment for Environmental Services (PES) schemes, is due for release later this month. Colombia: Severe drought in Casanare – who’s to blame?